Dateline West Greenwich, RI: Friday, 26 December 2014, over 107 runners came out to participate in one of New England’s most eclectic old-time style road races. Under a clear azure blue sky with brilliant sunshine, Rhode Island State Trooper, #16, John Gadrow, gave opening remarks welcoming all participants and thanking Mr Mike Tammaro, past-president of the Narragansett Running Assn for once again organizing the race. Running conditions were perfect with the air temperature at race time being 45F with a mild 10 mph westerly wind. Runners gathered at the Tavern on the Hill on RI Route #3 across from the West Greenwich, RI Police-Fire complex. The cost to participate was left to the runner. Contributions were later split so that the first male and female runner would win a purse and then three shares were raffled off to race participants. As shown in the photo, runners covered an 18 Kilometer scenic course of old homesteads, country farms, pastures, paddocks, and lichen covered stone walls. The course is challenging but achievable for all runners, male and female. No glitz or glitter. Just a great post- Christmas group run which has become an annual tradition for runners in Southern New England and beyond. The post-race festivities included a gift swap (items that you received but really wanted to get rid of, like that peppermint body lotion or green crystal candy dish). 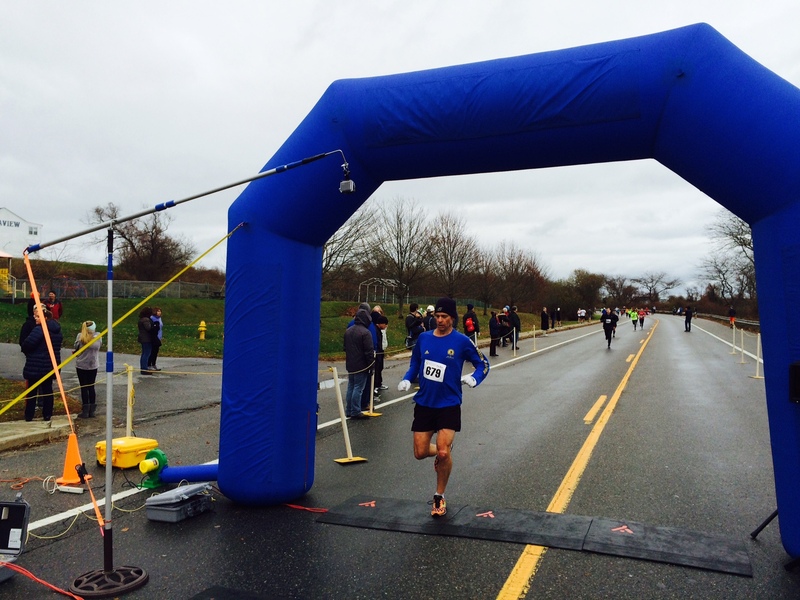 As a race reviewer, I give the 2014 Nooseneck 18K, 5 stars. One star for the concept, one star for the outstanding course setup with mile markers and cones at all turns, a star for the degree of difficulty / challenge, a star for the outstanding scenery, and a star for delicious food and post-run party at the Tavern-on-the-Hill. 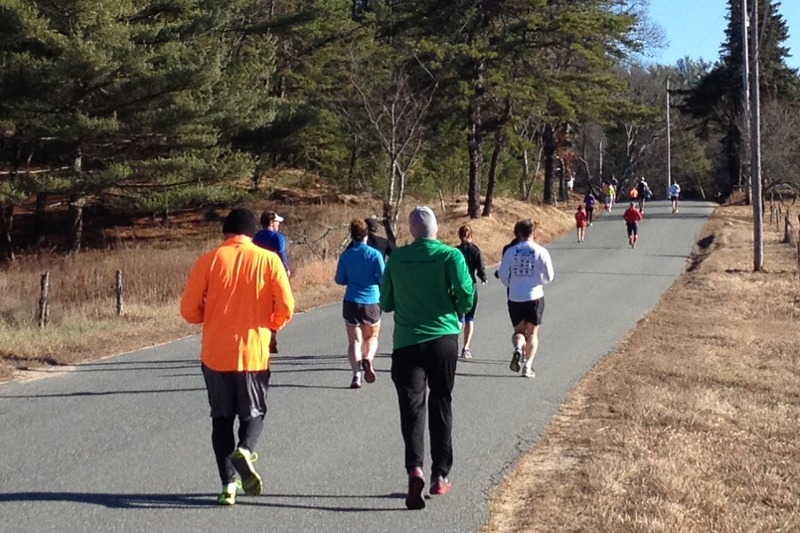 Spread the word and Mark your calendar for next year’s Nooseneck 18K which will mark its 10th year in 2015! Always held on the day after Christmas, December 26. A must for any serious runner’s bucket list. 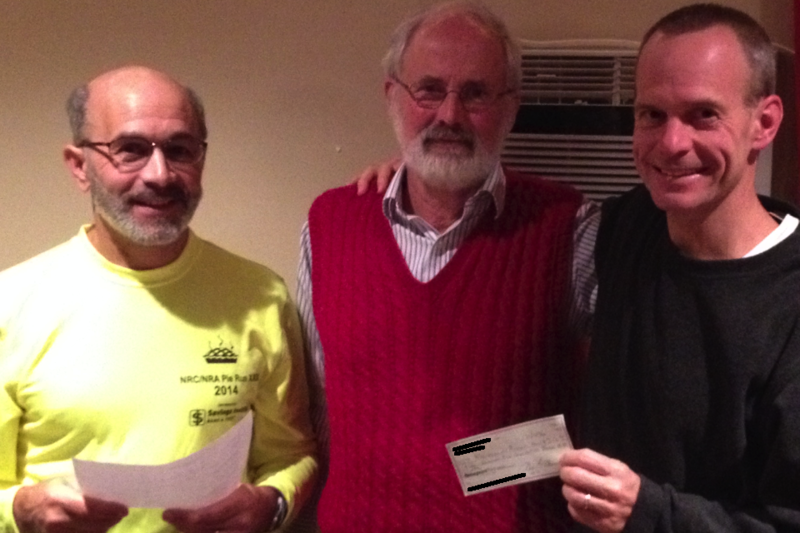 A big, big thank you to the Newport Running Club for their generous donation of $2500 to the NRA’s Summer Youth Track Series. The photo here shows NRA-representative Dave T. accepting the check at the annual Pie Run meeting. Thanks to Diane for alerting the authorities. November race results are in. Here are a few highlights! John Brindamour finished his first marathon at the Mount Desert Island Marathon on 10/19, congratulations John! 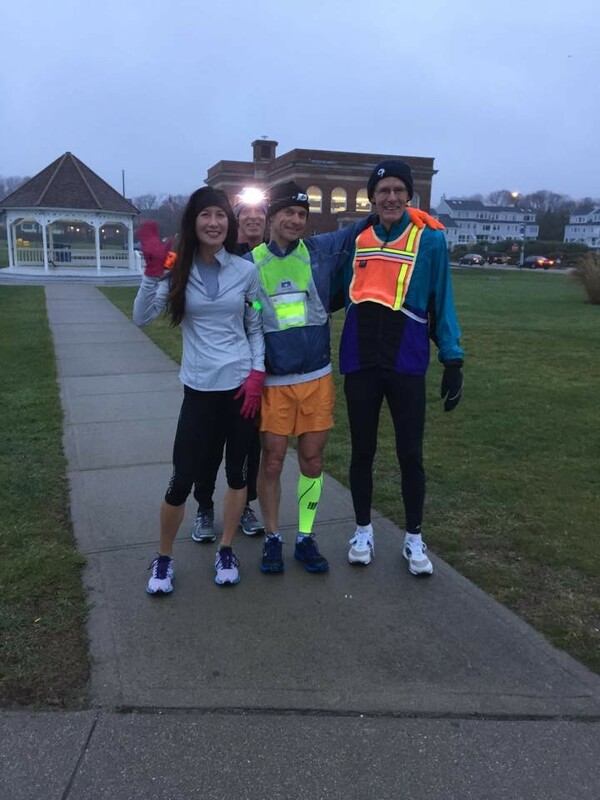 The month started with NRA’s own Gansett Half Marathon in a Nor’Easter and ended with the Newport Running Club’s Pie Run in perfect weather. Michelle San Antonio qualifies for Boston at Philly. Several NRAers hit the trails for the Li’l Rhody Runaround. Many overall and age group winners – see results below!